newprotest.org: FINALLY - ANT FARM! For a few years now, I've had the idea of having an ant farm in the house. I never really got around to it, what with all the other projects I've got running right -- my car, my welding, my CNC machine, my garden, etc., etc., etc. 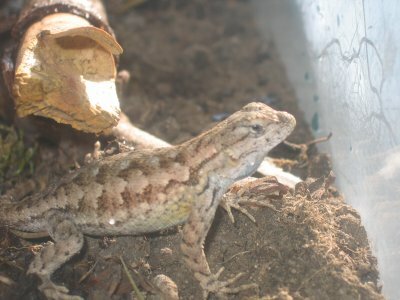 However, on my last trip down to California, I found a lizard (western fence lizard) that I decided to bring home. I kept it in a jar until I went to the pet supply store to pick up a terrarium. I believe it's a male, since it's got blue stripes on the belly... and I remember correctly, only the males of this species have that coloration. And here's a shot of shot of the terrarium. Nothing special, but it should give an idea of the size. After filling it up with rocks, dirt, moss, and some wood, I got some crickets and figured that the lizard was going to be content. Periodically, I'd find another bug to throw in the tank to add to the mix, just for fun. Today, I went to feed my lizard some crickets, and noticed a few ants running around on the moss. I looked a little closer and saw that they had tunneled into the dirt and were carrying around eggs and babies. And... that means I have a queen somewhere, laying eggs. Here's a video of some of the ants. By the time I got the camera, the ants had already moved all of their young, so all you get in this video is just some of the ants that hung around. Fun! I have an ant farm! 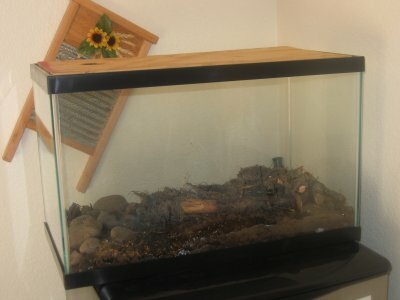 I'm trying to decide if I should buy some Plexiglas sheeting and construct my own multi-level terrarium to separate out the lizard from the ants. We'll see. UPDATE: See the this post for a better identification about this ant. UPDATE: This type of ant is Formica podzolica, a black version of the red Formica Pacifica. Formica pacifica: These ants are very abundant in western Washington. They like open, highly exposed areas and are quick to colonize newly cleared ground. 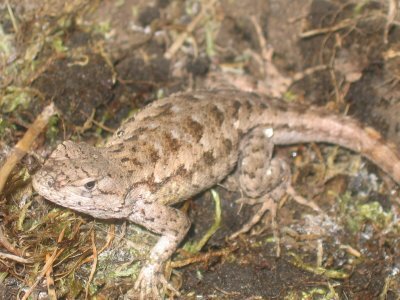 They were one of the first species to recolonize Mt. St. Helens after the eruption. They are common in parking lots, on sidewalks, and in not-too-lush lawns. They used to be common on the roof of the Evergreen Library (but may be having a hard time with the remodel). They nest in the soil. The nest entrances are inconspicuous holes in the ground, with a bit of excavated soil scattered around the entrance. Formica podzolica: This is like an all-black version of Formica pacifica. Formica podzolica is one of several very closely related species of all-black Formica, and I am never sure which is which. What I am calling Formica podzolica around here likes conditions that are a little less exposed than where F. pacifica is found. They nest in the ground but usually under stones or dead wood. They like grassy areas. COMMENTS for FINALLY - ANT FARM!